The warm water Albacore Tuna is one of the fastest swimming game fish in the North Pacific Ocean.When weather and warm water temperatures co-operate off the coast of Tofino, Vancouver Island in British Columbia we have the gear to target these unbelievable fighters. 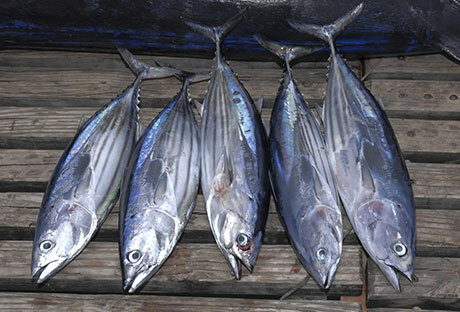 Tuna can be ravenous feeders when the bite is on making for some very intense battles. These fish range in size from 15 – 40 pounds in weight and can often be seen taking the lure and battling rods and fisherman for half an hour to forty-five minutes. This blue water fishing also makes for an unbelievable wildlife experience. White-sided dolphins, Whales, Sea Lions, Sea Otters are just some of the amazing wildlife that can be viewed on this amazing voyage. These trips are weather dependent and are a great option on a two day package in July and August. We often combine a stop on the way home at a halibut bank and drop our lures for some big boys, time permitting. There is an additional $600 charge to the daily rate if everything works out. When you find the school of Tuna, it is a hair tingling event; your daily limit for Tuna in Tofino is up to 16 Tuna per day. Bring your big coolers, you’re likely going to need them!